Click to the right of the profile name to update your personal information. You can also update your profile pic using the Change Photo option, if needed. Toggle switches to manage Task Notifications for the tasks created by you and assigned to you. Toggle switches to manage Milestone Notifications for the milestones created by you and assigned to you. Similarly, you can choose to or choose not to receive Email notifications When a message is posted in a forum, When you get a direct message, When a new document is uploaded, and When a user’s time logs are rejected. Only portal admins can configure the default email notifications for the new portal users or client users. However, users can also set preferences for their email notifications. 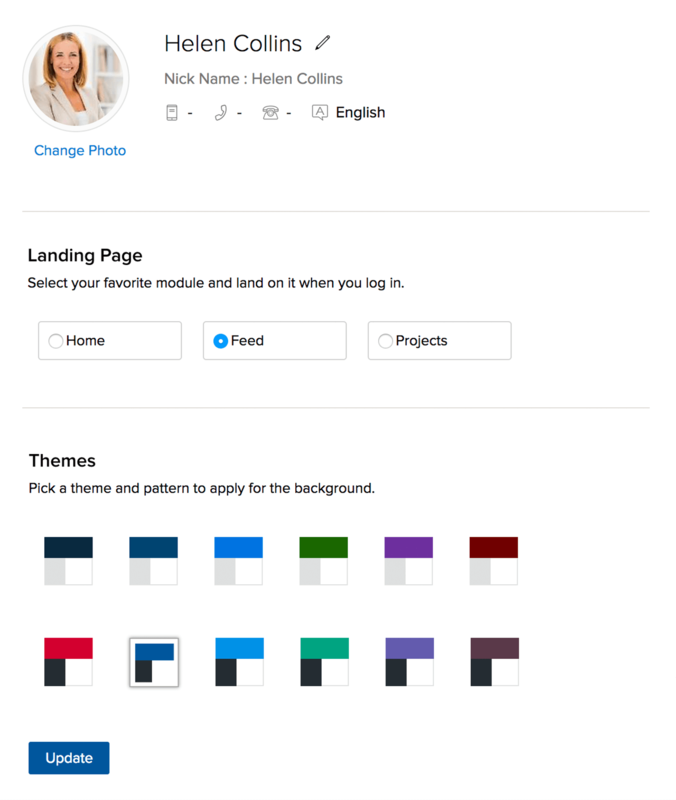 Navigate to the Personal Preferences section, click Notifications, and click Org notifications. Toggle switches to manage Task Notifications for the tasks created by the user and assigned to the user. They will receive emails for the category. Toggle switches to manage Milestone Notifications for the milestones created by the user and assigned to the user. They will receive emails for the category. If you want the users to receive Emails by default for all the activities in which they are involved, switch on the Notify users for all their activities option. Click Update after configuring the notification settings. 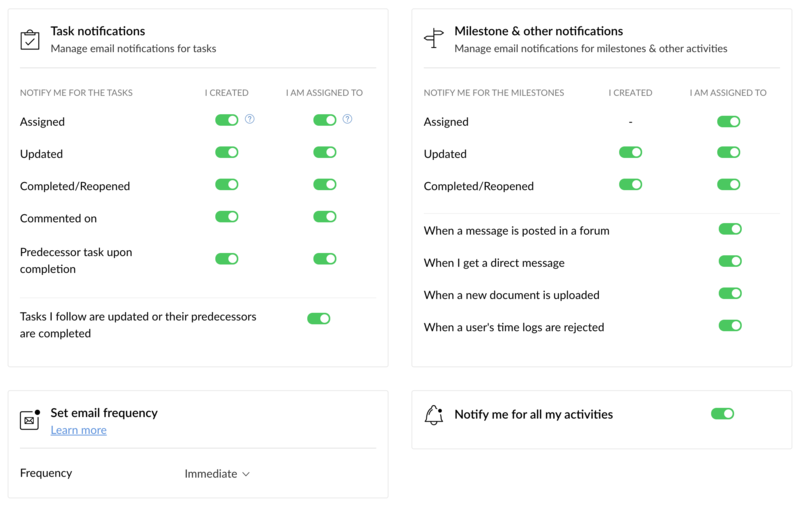 Configure your Email notifications for the pending and unassigned tasks from your personal settings. 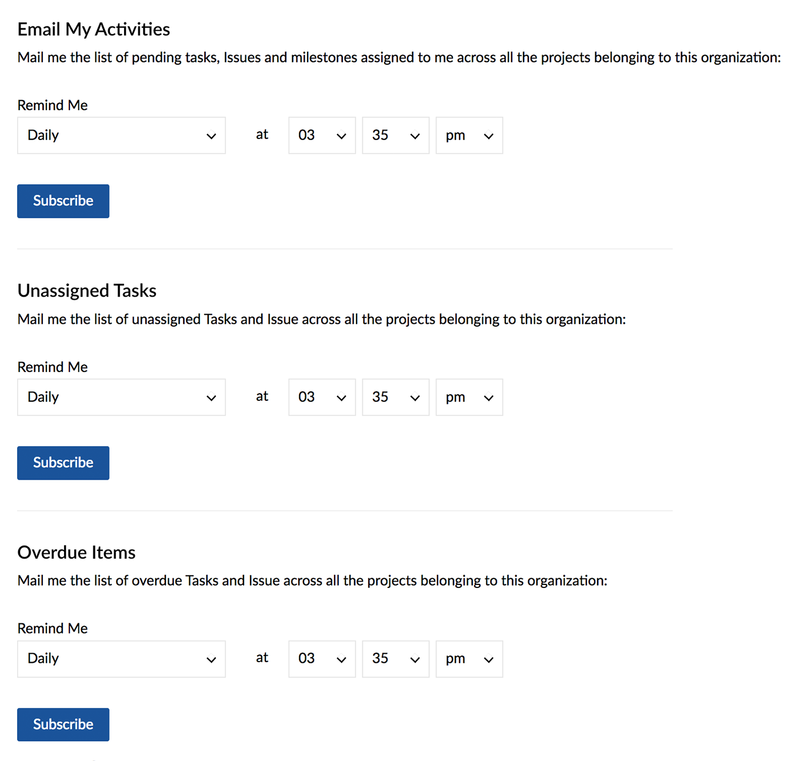 Email My Activities - the list of overdue tasks, pending tasks, and milestones across all the projects will be sent to you. Unassigned Tasks - the list of unassigned tasks and bugs (i.e. tasks or bugs that don't have an owner) across all the projects will be sent to you. Overdue Items - the list of overdue work items accross all projects will be sent to you. Select Time to receive the notification Emails for the pending activities and unassigned tasks.